By Javon Gilmore of Gresham, Oregon. Javon is organizing community opposition to yet another Wal-Mart in Oregon with Gresham First – specifically, they don’t want to see Wal-Mart at SE 182nd and Powell. We believe it's time for Wal-Mart to Wake Up – until they do celebrate Mother’s Day by not shopping there. Or even better join us at a rally and tell others about their exploitation of so many mothers around the country. The Wake-Up Wal-Mart campaign is a grassroots movement of Americans who believe by joining together in common purpose we can change Wal-Mart and build a better America. She would make 5-15% less than men, even if one took into account how long she had worked there and her performance on the job. Wal-Mart’s data would show that regardless of her job category she would make less than men, even though her and other women have less turn over and higher performance ratings. Even though 72% of Wal-Mart’s hourly workers would be women, it would not be very likely that she would become a manager (only 33% of managers are women and 15% of store managers are women). Odds are that she would be amongst the lowest paying positions with the company (according to documents from the Dukes v. Wal-Mart Discrimination Lawsuit). For all of this, one might not be surprised that they are party to the largest gender discrimination lawsuit in history. 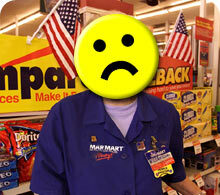 Only in the case of health care do all Wal-Mart associates seem to get the same treatment – nobody can afford it. So, this Mother’s Day join communities across this nation and “Love Mom, not Wal-Mart.” Sign up at WakeUpWalmart.com and take action now. Thanks for the support, and keep up the good work! Closer to home, Wal-Mart is the only self-insured employer in Washington State to have their self-insured status suspended for their worker's compensation claim practices. They are a real "kick them while they are down" kind of corporation. This was not the result of a few bad seeds, their infractions were pervasive throughout their organization in Washington. Thanks for posting this on here Javon. I live within walking distance of where they want to place the Supercenter. Onward Oregon has a great section on Walmart. Been working on stopping the one in Beaverton. http://www.savecedarmill.org - get on the e-mail list and get ready to rumble!